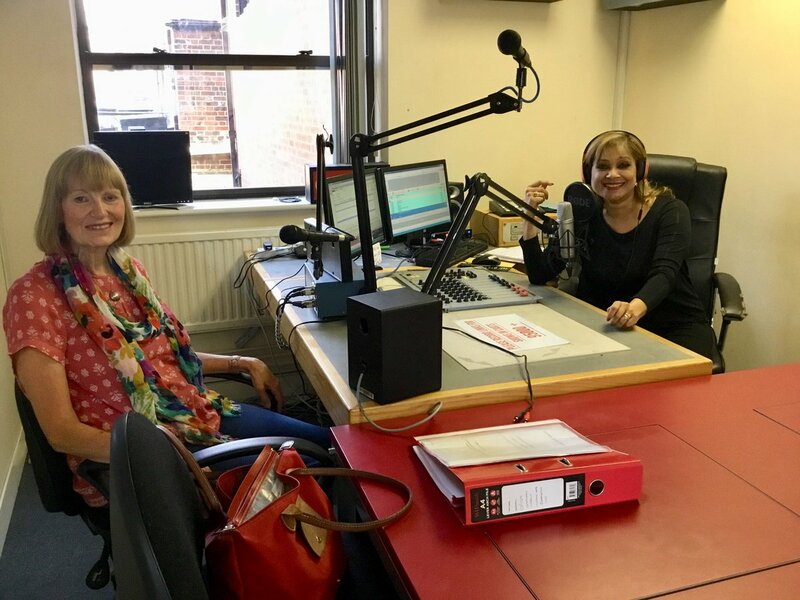 If you’d like to hear me being interviewed by Mimi Harker Obe on Wycombe Sound, the programme is being aired tomorrow, Sunday 29th at 12 noon till 1pm…sleuthing, books, life and a bit of music. 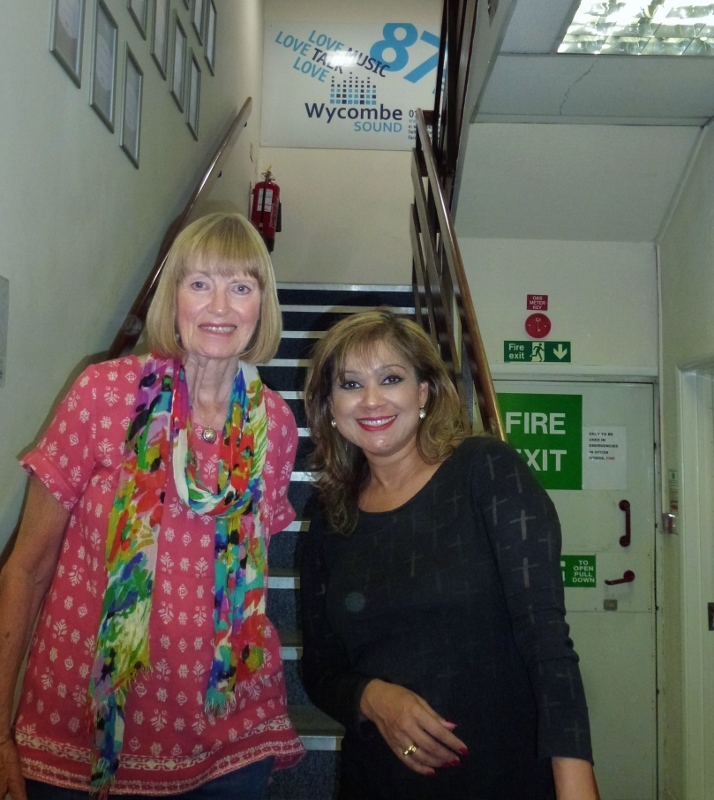 …picture taken after an interview with Mimi Harker Obe at Wycombe Sound in High Wycombe about my work on the Ruth Ellis story and much more. Particularly poignant as today, 13 July, is the 63rd anniversary of her death. 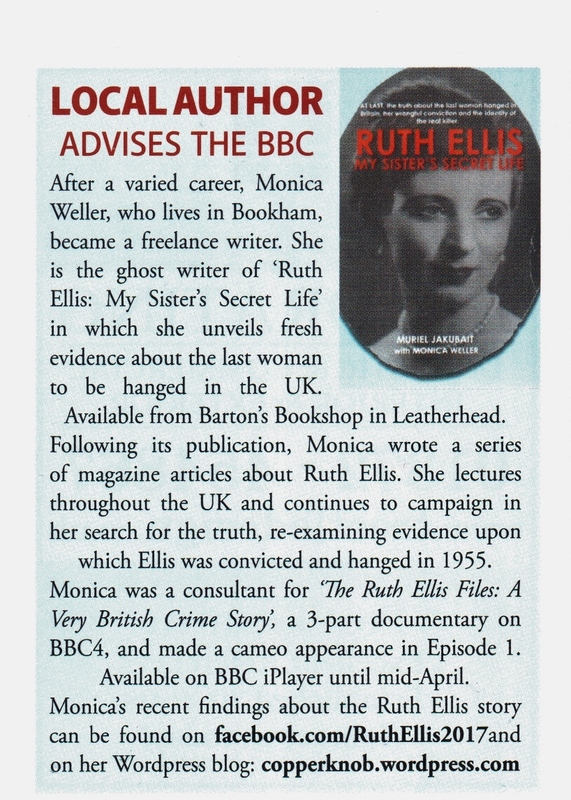 I wrote the following about Ruth Ellis’s possessions in our book RUTH ELLIS MY SISTER’S SECRET LIFE . The book was published in 2005. I am sure therefore that Muriel Jakubait, having tried relentlessly (with her mother) since 1955 to retrieve Ruth’s belongings including the tape recordings her sister had made, would have been horrified if she had been alive to see a journalist simply produce the tape in the tv documentary The Ruth Ellis Files 60 years later on BBC4! TV viewers of ‘The Ruth Ellis Files‘ would have been oblivious of the back-story about Ruth Ellis’s lost possessions, as a journalist handed over a recording of Ruth Ellis. At least I’m still around to see the skulduggery that’s gone on over the last 60 years! A police constable who had been off duty and drinking in the pub brought Ruth Ellis out. He was there when the shooting started…I had to arrange for two PC’s [sic] to look after her. Ruth was very quiet. People said she was drunk, but she wasn’t”. This is odd. PC Thompson, the off duty police constable who’d been drinking in the Magdala that night, did not bring Ruth Ellis out of the pub. She was already outside when he exited the pub. And for WPC Frances Garrad to say he [PC Thompson] was there when the shooting started is misleading. He was actually inside the Magdala and did not see the shooting that was going on outside. When I researched for ‘Ruth Ellis My Sister’s Secret Life’ published in 2005, I could find no reference to WPC Frances Garrad in any files at The National Archives or at the Home Office. I was therefore intrigued to know where Carol Ann Lee’s information about this WPC came from. So I decided to contact the Metropolitan Police under the Freedom of Information Act in March 2016, and again in April 2018 for further details about Frances Garrad. “The Metropolitan Police Service neither confirms nor denies that it holds the information you have requested as the duty in Section 1(1)(a) of the Freedom of Information Act 2000 does not apply by virtue of the Section 40(5) exemption. This response therefore represents a Refusal Notice in accordance with Section 17(1) of the Act. Please see the legal annex for the sections of the Act that are referred to in this letter”. It took some time and re-reading of the Notes section in Carol Ann Lee’s ‘A fine day for a hanging’ (there is no index) to discover Ms Lee was quoting from an article entitled ‘Frances switched from Clippie to Copper’ published in 2003 in a west country newspaper. “Lots of info that wasn’t in the press at the time. TV program this week (13 March 2018) confirms most of what’s written. If there’s an interest in this lady, then this is a good buy”. I noticed there are a couple of reviews about The Ruth Ellis Files, for which I was a consultant, on IMDB. I feel there’s still scope for revealing more of the truth. It would be interesting to read more comments. I’ve decided to start researching again. A couple of characters who were deeply involved with the original stories published about Ruth Ellis have always intrigued me. There was a 4-part Ruth Ellis life story written by journalist Douglas Howell and published by Jim Eilbeck in the Woman’s Sunday Mirror in July 1955. And secondly the book ‘RUTH ELLIS, The Last Woman to be Hanged’ by Douglas Howell penned under the name Robert Hancock which was published in 1963. I’ve uncovered a 1952 profile article about the pioneering female barrister Rose Heilbron, written by Douglas Howell which was inaccurate and sensationalist about her private life. And this was three years before he wrote Ruth Ellis’s so-called life story which has been quoted ever since as factual! Jim Eilbeck threw himself under a train in 1957. 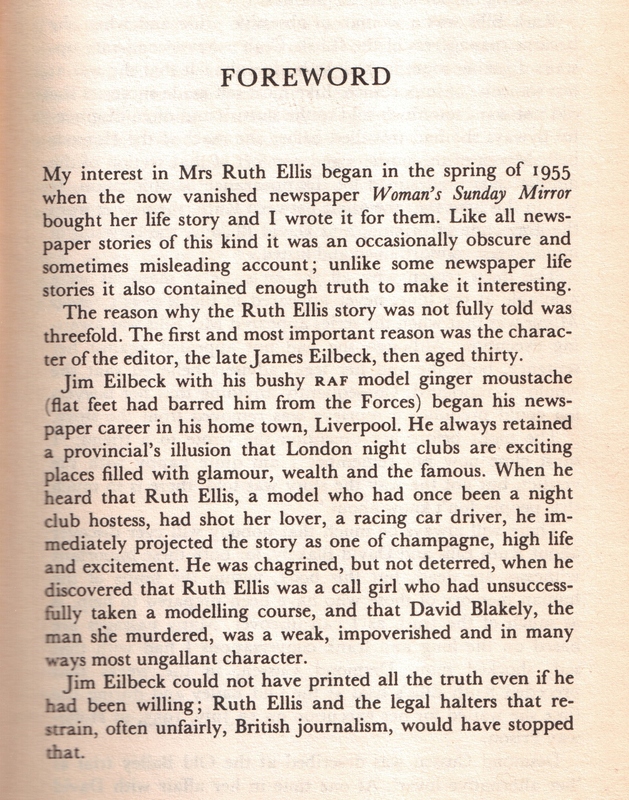 Excerpt of Robert Hancock’s foreword in his 1963 book ‘Ruth Ellis, the last woman to be hanged’.